Go to Dashboard > My sites > click on edit icon for the site you are setting up the product. Step 2: Go to Sellers > Sellers Dashboard and click on "Add a Product" button, if you have already added a product, edit it. Step3: I will not go over all the fields, as they are self explainatory, however we will make the ControlCenter specific settings. Click on Content link on the navigation and from the listing you can get the SEF URL for salespage, this will be the URL you need to enter as the landing page. Tick (select) "Pass parameters to Download Page"
d) Delivery Method: Select "Thank You Page" and enable "Pass parameters to Download Page"
e) Autoresponder integration: I would suggest "Select none" if you are using Aweber, or Getresponse as ControlCenter will send the buyer name as well to your autoresponder, so the integration from ControlCenter is better. 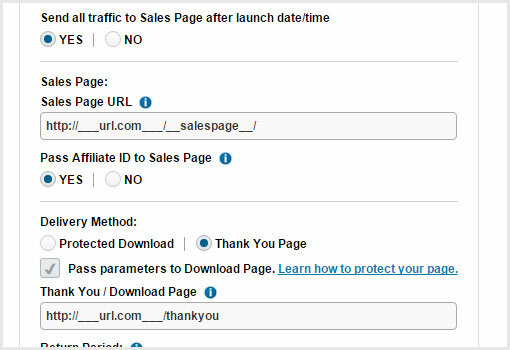 You may set "Allow Sales" to "Yes"
JVZIPN URL: You may get the exact URL from your ControlCenter i.e. Then go to ControlCenter again.